First, may I commend you for looking for guidance on finding the right words of comfort for sympathy. Yet, I also have wondered when I write this pages if too much focus on saying the "right thing," causes people to be more anxious and thus avoid their bereaved friends. The following poem offers a great amount of wisdom in a few words. Those interested in learning to offer sympathy would do well to spend some time pondering it. The challenge of looking for words of comfort for sympathy is that too often there really are no adequate words to offer. It doesn't take long to say the important words of "I care," so we feel caught in trying to fill the silence with something else. Our society has a tendency to fill all silences with words or other background noise. So the challenge is, "Are you willing to be counter-cultural and sit in a silent space with your bereaved friends if that is what they need?" Others will want to talk, so let them lead the conversation where they need it to go. So read the advice that is offered and then be gracious with yourself--we've all said things we wish we could take back. Most importantly, be present, stay present, and care. 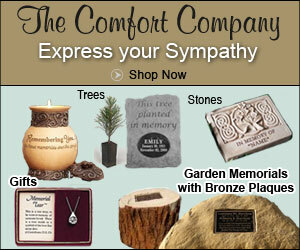 Struggling to find the perfect sympathy gift? So was Renee Wood, so she designed her own. Read my interview with Renee, Founder of The Comfort Company.